Moore County is located in central North Carolina. The southern two-thirds of the county is located in the Sandhills region, the north is part of the Piedmont. The county seat is Carthage. The county was named for Alfred Moore, who served in the Revolutionary War and later on the United States Supreme Court. The county is probably most well known for being the location of Pinehurst, an upscale golf resort which has hosted many tournaments and has proved a retirement destination in recent years. Thus, the county has a higher proportion of seniors than average. Overwhelmingly white, Moore is a strong Republican county and has been for decades. 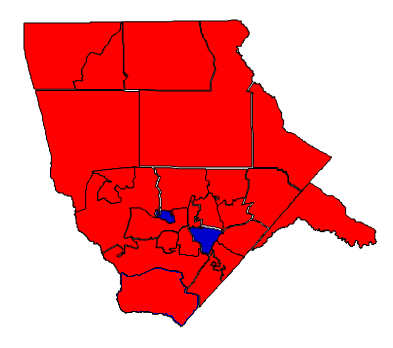 During the period of the Solid South, it was often the easternmost county where Republicans dominated. The Republicans in Moore County are divided between traditional rural conservatives and those of the country club variety. The latter tends to be less socially conservative, which is why Moore voted for Amendment 1 with 63% of the vote, only slightly more than the state average. Mitt Romney, on the other hand, won here with 64%. The politics of Moore have remained remarkably stable, not trending in either direction; most of the time Republicans carry the county with somewhere between 60-66% of the vote. Despite Moore County’s Republicanism, perhaps its most famous (or infamous) native son is John Edwards, former U.S. Senator, vice presidential nominee, and presidential candidate whose political career was ended by an adulterous affair and his fathering a child out of wedlock. Edwards grew up in the little town of Robbins, which is in the northern part of the county. Forecast: The last Democrat to carry Moore County in a presidential contest was Lyndon B. Johnson in 1964. Republicans have carried Moore in every contest thereafter. In 1992, Bill Clinton did better than the average Democrat, losing by only 10 points by peeling off more rural voters, but this group returned to the Republican column in 1996 and have never left it. The selection of native son John Edwards on the Democratic ticket in 2004 had almost no effect on the election results here. Since then, Moore has become even more Republican than the national average; the large number of white voters and elderly population not being ideal targets for the Obama coalition. The county grew by 18.03%, about the state average, which is of course much higher than the national average. Strikingly, Moore County is even more white than it was a decade ago, as more wealthy white people have moved into the county. Blacks are a falling proportion of the population, though have registered in greater numbers recently. The advent of the recession has halved the growth rate. Stability is the name of the game in Moore County. Despite a growing population, Republicans are expected to maintain their dominance here. If there is any long-term trend at all, it will probably be to the benefit of that party. As has been the case for many decades, the Republican base here is sizeable enough to preclude any prospect of Democratic victory.